Whatever your commercial, industrial, or military shipping needs may be, Hardigg Cases manufactures the right case to ensure that your equipment and materials arrive intact and ready to perform. With 45 years of standard-setting, innovative engineering, Hardigg Industries has earned its reputation as one of the world’s leading manufacturers of rotationally molded cases. 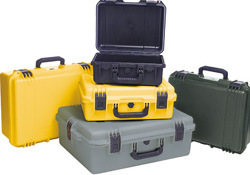 Hardigg’s collection of 295 COTS [Commercial-Off-The-Shelf] standard case sizes offers the largest selection of rotationally molded reusable cases in the shipping case industry. Hardigg offers unlimited custom case configurations, including a wide selection of colors, shapes, and sizes, as well as customized foam interiors to accommodate the transportation of specialized equipment. To protect against the handling hazards of shock, vibration, moisture, and temperature extremes that can occur during shipping, our cases are water tight, airtight, dust-proof, and corrosion-proof – and designed for the easiest and most efficient handling, loading, and stacking. Hardigg produces lightweight and heavy-duty industrial cases of every variety: Single-Lid, FlangeMount, Double-Entry Shock-Mounted-Rack, ProRack, Customized, Mobile Workstation, and Double-Wall Insulated Containers. Our polyethylene and polyurethane foam inserts and our elastomeric shock-mountings provide the shipping protection you need to transport anything with absolute confidence, including. In addition to meeting Air Transport Association (ATA) requirements, EIA standards, and relevant Mil-Specs, Hardigg Cases make the toughest cut: ours. In Hardigg’s on-site testing laboratory, we subject the cases to the stresses often incurred during air and ground transport - both commercial and military - including shock, vibration, moisture, weather and temperature extremes. This way we know that our rotationally molded cases are designed to protect in the most extreme atmospheric or handling conditions.